Months Long Search Ends on a Happy Note and $100,000 in Cash! How did Winloot.com finally reach Mr. Patrick Acker? 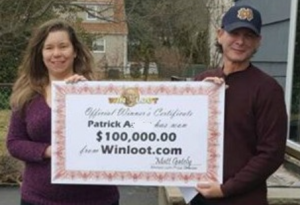 Woodland Park, NJ, January 10, 2017 (Newswire.com) – ​​​On a cool January 5, 2017 morning, following a months long search, members of the Winloot.com Prize Department were finally able to personally hand a check for $100,000.00 to Mr. Patrick Acker of Woodland Park, NJ. Mr. Acker originally matched all 6 winning numbers in the Winloot $100,000 online sweepstakes game on August 31, 2016 but far reaching efforts to contact him proved elusive. So how did Winloot finally reach Mr. Acker? It turns out that Patrick is not the only Acker who plays Winloot.com. Fair enough Patrick. There’s a new drawing every day at winloot.com and as you know better than anyone, you can’t win if you don’t play. 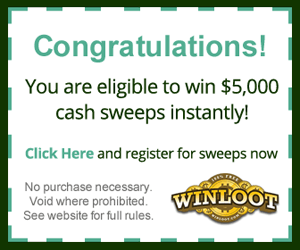 Long Island, NY based Winloot.com is a 100% free online sweepstakes which provides players thirty chances to win a variety of different prizes including a $25,000, $50,000, $100,000 and a $1,000,000 jackpot every day. In addition, users can also play up to 65 Bonus games in which people can find out instantly if they win cash prizes up to $5,000. And if that’s not all, Winloot also guarantees a daily cash prize of $250 to $1,000. 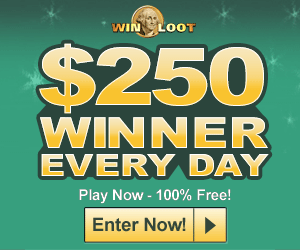 Winloot – More Winners Every Day!